The other condition that both Dr. D’Antonio and Dr. Rogers want me to clear up is lymph congestion. To maintain optimum health, it’s essential to keep the lymph flowing! You may be asking yourself: What is lymph? When I talk about lymph congestion, most people think I’m talking about either nasal congestion or lymph nodes, but I’m not. Lymph fluid is the clear liquid that surrounds all cells. It is the cell’s environment, made up of water, nutrients on the way to the cells, and waste byproducts leaving the cells. How much lymph does a body contain? Even though you don’t hear much about lymph fluid, there is actually three times more lymph fluid in the body than there is blood! When cells are inactive, toxic waste builds up around the cells. Our cells function best, however, when the lymph is clean and fresh with the proper concentration of exygen, glucose, electrolytes, amino acids, proteins, fatty substances, carbohydrates, and hormones. Cells need fresh lymph fluid the same way that our lungs need fresh air! But here’s the problem: the lymph fluid doesn’t have a heart to pump it the way the blood does. 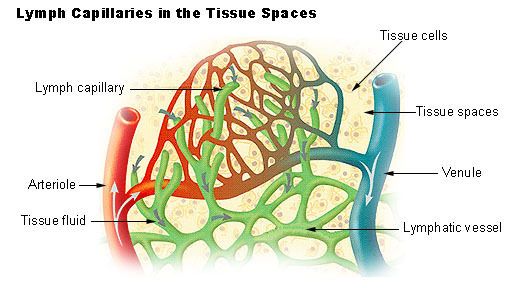 Lymph tubes are filled with millions of one-way valves. Pressure built up below the valves cause them to open, while pressure above the valves keep them closed. Overall, if the lymphatics function properly, we are healthy, and if lymph circulation becomes sluggish we become sick. So, how do we keep the lymph moving? Conditions that keep lymph fluid flowing, include: 1) vigorous muscular activity, 2) changes in atmospheric pressure, and 3) change in gravitational pull. For me, that means I need to be more conscientious about staying hydrated by drinking plenty water, as well as hopping on the rebounder for several minutes every day. I’ve gotten away from these since school started, But it’s never too late to renew a good habit!